"Seasons Of The Dead" was a landslide release from one of the most ancient Death metal groups Necrophagia. Even to this days, this album has stood the test of time and remains one of the most innovative and groundbreaking releases ever. It is still accepted in the brutal underground Death metal genre and has surely inspired legions of today's successful musical artist of this type of metal (Emperor, Mayhem, Dimmu Borgir ... even Cradle of Filth). However, this horror metal show is not a success for my taste. 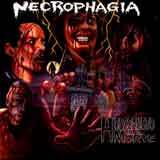 Necrophagia is to rigid and this record would have shocked some minds twenty years ago, but today is another story. It is like an old 45t record who "is played" at 33t. What a lack of inspiration guys. We have heard that two thousand time before. Simply boring !